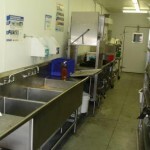 Great for large events, emergency relief and renovation projects, our mobile kitchens are semi trailers that convert into restaurant style kitchens fully equipped with commercial grade appliances and prep area so that you can prepare food for large events as well as handle the clean up. 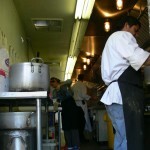 The mobile kitchen can be configured with equipment required by your chef or staff so they can best cater your event. The hot trailer is also equipped with a 7’ x12’ walk in cooler, 2 compartment sink with hot water heater. 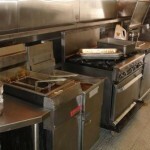 Stainless steel prep tables and shelving are available. The Dishwasher Trailer is equipped with a 7’ x 12’ walk in cooler. The unit provides dishwashing capability with a three-compartment sink, large capacity dishwasher and independent hot water heater. The Pantry trailer has a 7’x12’ office space with desk and shelving. The unit is equipped with a porter/ mop station with hot water heater. Dry storage shelving units. Additional reach in coolers and freezers available for this unit. Delivery, set up and tear down charges apply. 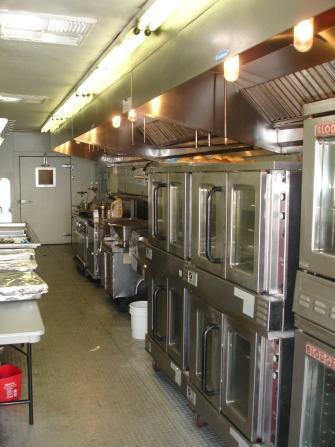 Mobile kitchens are available for a weekend event or can be leased on a monthly basis. These units have served in many capacities. They were first constructed and used to feed the National Guard for 16 months following the Katrina disaster in Louisiana. 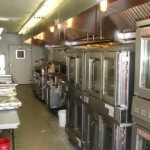 At the peak we were serving 8000 meals daily from these units. The local Carpenters union has also utilized these mobile kitchen trailers for 18 months while they built a kitchen at their training facility. 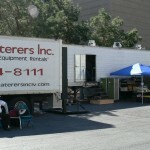 The local football stadium uses the hot trailer during special events. 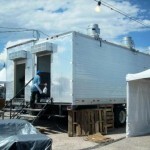 The trailers have also been utilized by the Ritz Carlton at Lake Las Vegas during their Kosher Show. As you can see, a mobile kitchen offers great convenience if you are hosting and outdoor event and can mean the difference in fresh warm food or cold food being served to your customers and guest. 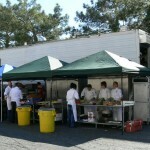 If your kitchen is inside or nowhere near the guest area, a mobile kitchen is the smart choice. 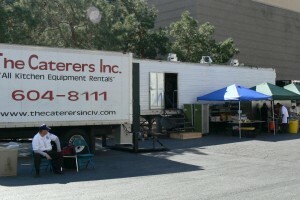 Contact The Caterers Inc now to reserve a mobile kitchen trailer and dish washing trailer for your Las Vegas event.